READING, MASS. — In one of the first-ever transactions of its type, a Quincy, Mass-based developer has conveyed to two retailers vertical retail condominiums built on a recycled municipal landfill. The condos are at The Crossing at Walkers Brook, located on Route 128 / 95 in Reading, Massachusetts, a $90 million retail destination that is fast becoming a regional landmark. With the closing in mid-December, Dickinson Development Corporation and its partners in Walkers Brook Crossing, LLC, conveyed ownership of the 23.5-acre site to condo owners The Home Depot and Jordan’s Furniture. Because of the height of the landfill terrain, the stores are stacked vertically and each retailer has its own parking lot level entrance. Home Depot, which opened in August, occupies 140,000 square feet on the first level, and Jordan’s Furniture, which opened in October, has 260,000 square feet on two floors above, including a 450-seat IMAX Theater. Dickinson Development President Mark Dickinson, who first approached the two retailers and Reading town officials with his idea to recycle the landfill more than five years ago, said, "This arrangement allows both retailers to own their own property in an ideal location on a very complex site." 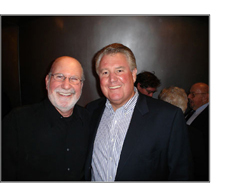 Shown are Eliot Tatelman (left), President of Jordan’s Furniture and Mark Dickinson. The two retail condos and the adjacent Chili’s Restaurant comprise Phase I of the 33-acre site. Phase II, which began in November, will have about 70,000 square feet of retail space in a 'lifestyle strip center' that will open in the summer of 2005. That space is 97% leased. Engineers with the firm of Haley & Aldrich (one of the three engineering firms involved in the project) have called it "The most complex and significant landfill project in the United States." Because the solid waste landfill had been in use from the 1930s until 1984, early planning involved complex hydrogeologic investigations and geotechnical studies in order to create the required space in the most cost-effective way. Working with Mark Dickinson to shepherd the project through from concept to completion has been company Vice President Ed Shaw who said the project tested the most veteran engineers and architects. "Contributing to the project’s complexity and cost were the need for mechanically stabilized earth (MSE) retaining walls up to 35’ high, gas collection systems, recompaction of relocated waste, unique landfill cap design and 1,500 foundation piles to support the building." Brinker International, parent of Chili’s Restaurants, signed a long-term lease for a 217-seat restaurant that opened in September. The store sits on a 1.4-acre parcel adjacent to Home Depot and Jordan’s Furniture. 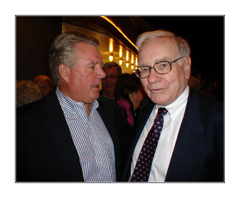 Shown are Mark Dickinson and Warren E. Buffett, Chairman of Berkshire Hathaway, Inc., owner of Jordan’s. Retail tenants who have signed leases for the Phase II portion include Staples, Linens 'n Things, The Paper Store, Roman's Macaroni Grill, Bear Rock Sandwich and Specialty Restaurant, Bank of America, Starbucks, and another retailer. Only 2,000 square feet remain. Dickinson and project partner Pinnacle Partners' project team includes: For both Phases I and II: engineering firms Haley & Aldrich, Dufresne-Henry and Vanesse Hangen Brustlin, Inc. and architect Carter-Burgess. Morris & Morse Co, Inc., of Boston served as financial advisor to Dickinson. In Phase I, Suffolk Construction was general contractor and Pinncon LLC was construction consultant. In Phase II, general contractors are Pinncon LLC and D. W. White Construction. Financing for Phase II is by Eastern Bank. Leasing for the center is handled by The Wilder Companies of Boston. In all, the project has created more than 1,000 construction jobs and will create some 1,000 new full and part-time jobs once all the tenants are open for business. It will bring more than $500,000 annually to the town of Reading in new property taxes, plus untold millions in sales and income tax revenue to the Commonwealth. Founded in 1980, Dickinson Development Corp. is a commercial real estate development company that has developed over three million square feet of office, retail and industrial space and hotels in New England and Florida. (For more information, contact Ed Shaw or Mark Dickinson: 617-770-1955 or visit www.dickinsondev.com).